Reading Time: Three Bags Full | Small, but valuable. One of the things that changed during the first several months of marriage was the reading pace I used to keep up. Reading together isn’t something that Scott and I do very often, and thus my reading time decreased pretty significantly in the past several months. Not a big deal, just true. But… I was glad to read a whole heck of a lot on the plane last week, and I managed to start and finish a book in old-timey Hannah pace. It felt good to get swept into the story and finish it before my new-book-momentum lagged. When you read a book slowly, you have to keep getting back into the story and remembering who did what and who has what strange habits, etc. It’s like seeing new acquaintances once a quarter and trying to keep everything you learn about them straight from January to April. If you read quickly, it’s so much easier to keep all of that information straight in your brain. So, what wonderful book entertained me on the way from Virginia to Colorado and back again? 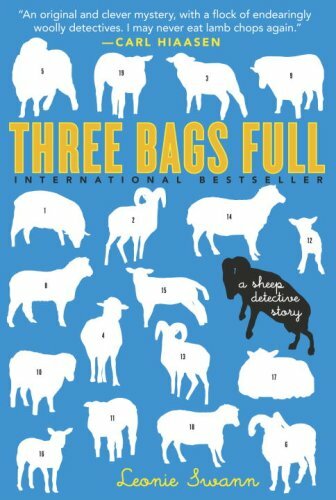 As you might have guessed from the post title, I read a book called Three Bags Full by Leonie Swann. It was pretty great. Let me tell you why. A good cover never hurts. I might lose you here, but the book is written from the perspective of a flock of sheep in Ireland. They’re smarter than your average sheep, largely because their shepherd has the habit of reading to them daily from a wide variety of materials. Or had a habit. The book opens with the murder of their shepherd. The sheep decide to investigate their shepherd’s murder, and then they’re adventuring away for the remainder of the book. The sheep are such endearing characters. Each has strengths and a very clear personality, some more traditionally sheepish than others. Each contributes ideas to the investigation (again, some more than others), and it’s a wonderful story about the flock as a whole and a few sheep in particular. The people of the village get their fair share of page space, too, to round things out a bit. The plausibility of the story surprised me. (Sheep doing investigation of humans?) But at the end of the story, I was so pleased that the author chose to tell the story through the sheep. In a weird way, thinking through the perspective of sheep for a few hundred pages is a little bit like thinking through the perspective of another culture for a while. It helps you to see things in the story that would normally escape notice. And that made me wonder what similar things I might be missing in real life, which can be a fun feeling sometimes. Who doesn’t want to have a richer day to day experience, right? So do I recommend this book? Absolutely! No matter what you’re reading, I hope it’s helping you to see things from a slightly different perspective. And I hope you’re loving it.